High-Performance Green Schools are healthy and productive environments. They are also cost-effective facilities that conserve energy, use renewable resources and have lower annual utility and operating costs. The City of Newton placed an emphasis on reaping the benefits of a sustainable, high-efficiency modular building for a classroom expansion at the Newton Oak Hill Middle School. By funding and constructing this building, the city is sending a clear message that sustainability matters. 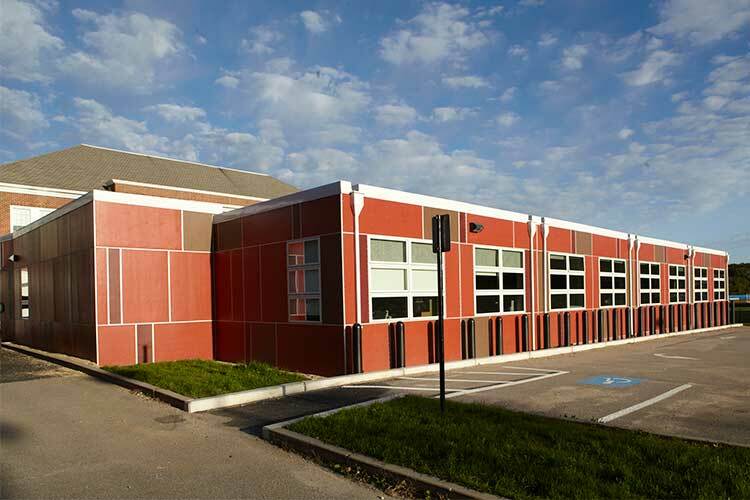 In general, this Modular Classroom Building was designed to meet the goals of Massachusetts High Performance Schools Protocols (MA CHPS), including the integration of ‘Air Barrier’ construction, daylight harvesting, minimized HVAC systems, and many other ‘Green’ features. The ability to relocate one or more of these classrooms will maximize their utilization and minimize the risk of what might have been four permanent classrooms that would go unused or be underutilized after this short-term enrollment ‘blip’ passes. If one or more of these classrooms is relocated to another city school in the future, the savings in capital construction will be significant. Foundations were poured below grade to accommodate the potential move and an air barrier was installed between each classroom so that these classrooms can be sealed up easily and it will not affect the integrity of the air tightness of the remaining portion of the modular building.